Discover the weird, wacky and wonderful world of nature at our Zoos during February School Vacation week. On Monday, February 18, don’t miss out on the birthday party for western lowland gorilla, Little Joe, who turns 26 in February! Learn more. From gila monsters to bats, tarantulas to cotton-top tamarins, the natural world is filled with incredible biodiversity. Chat with zookeepers and stop by the education station in the Animal Discovery Center to learn more about the unusual animals that call Stone Zoo home. Register for our February Vacation Week Program: Explore the world of animals in the winter! 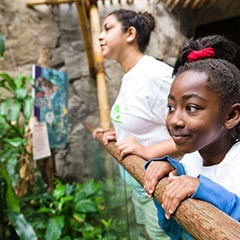 Each day will be filled with fun games and experiments, up close animal encounters, and going behind the scenes at the Zoo while we learn about what we can do to help save animals in the wild!